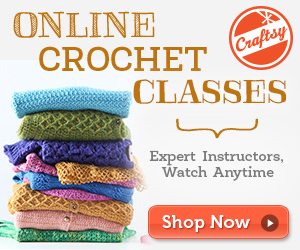 We are in the middle of July now. Time fly by! This month is just the beginning of the raining season here in Thailand woohoo! 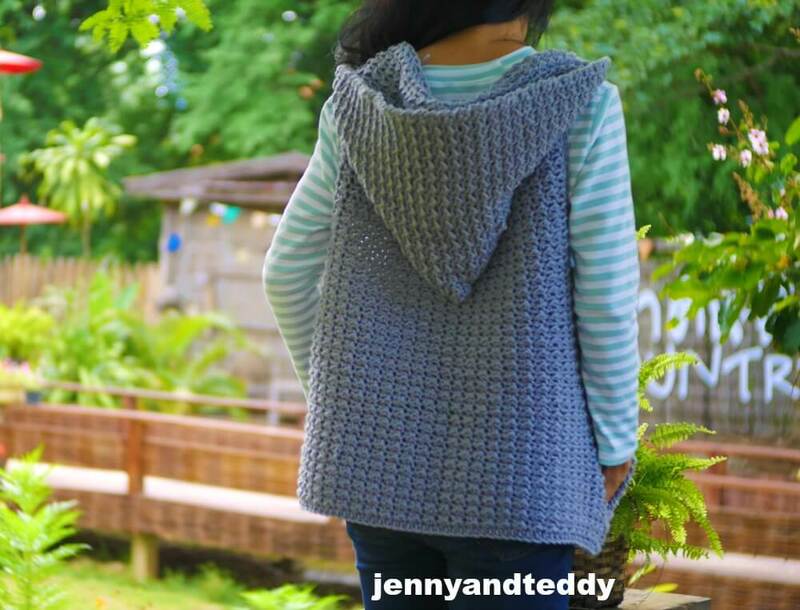 So I was tempt to make a boylish hooded vest jacket but they are turn out to be the girly girl pretty vest cardigan instead. 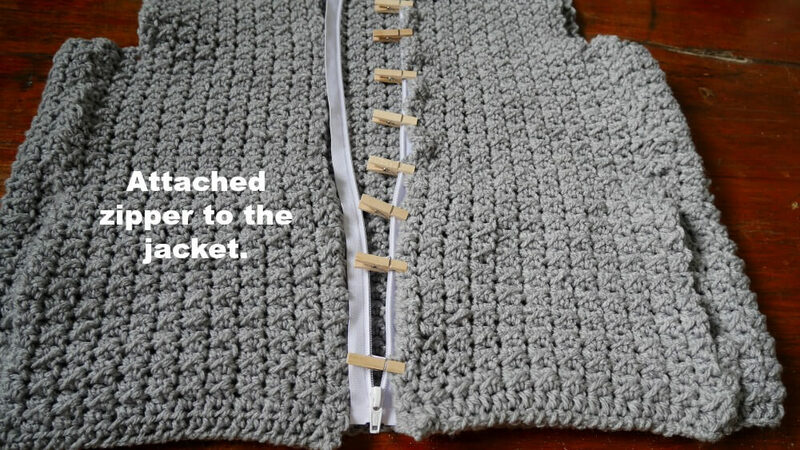 But this time it is perfect right of the hook and I did add a zipper to the crochet piece too. It was my first time to add zipper to crochet project especially garment, oh well they are super easy guy! 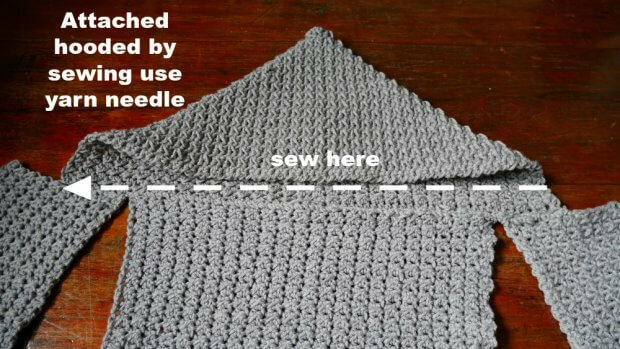 I did not have sewing machine so I did hand sew and oh they are quick to do. and I even add a pocket as well. 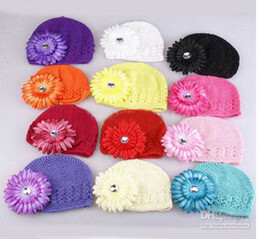 I make them with chunky acrylic chunky yarn with 6 mm crochet hook. 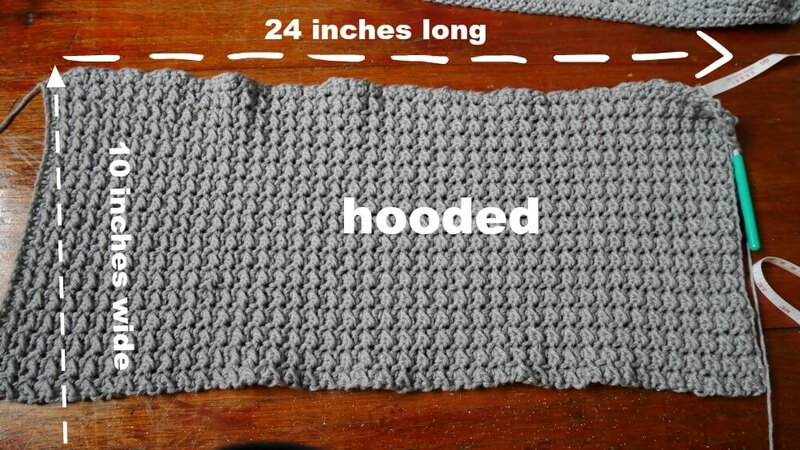 – I used bulky yarn, yarn weight 5 bulky. 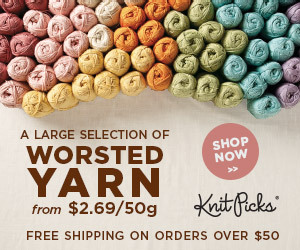 , The one That I would recommend is from knitpicks Brava bulky yarn, 100% arcylic They have a great varities at a good price!!! I Love them ^^. 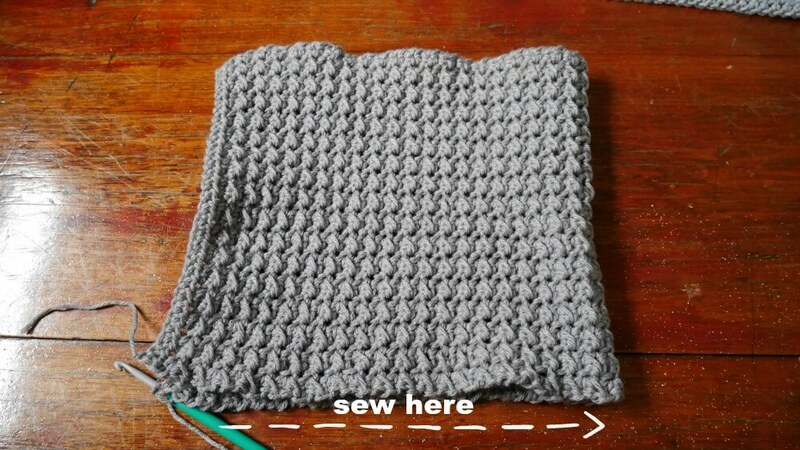 Brava bulky yarn. 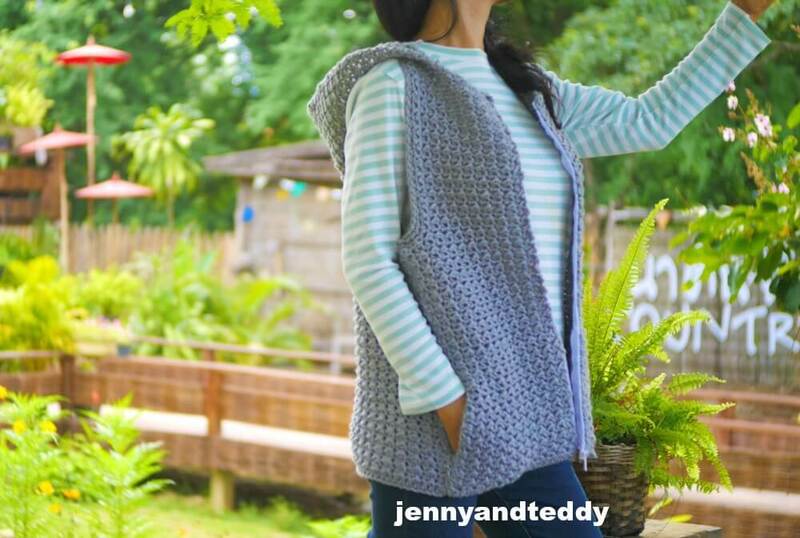 Or you could go for cotton blend for comfy texture with Plymouth Jeannee Chunky Yarn. 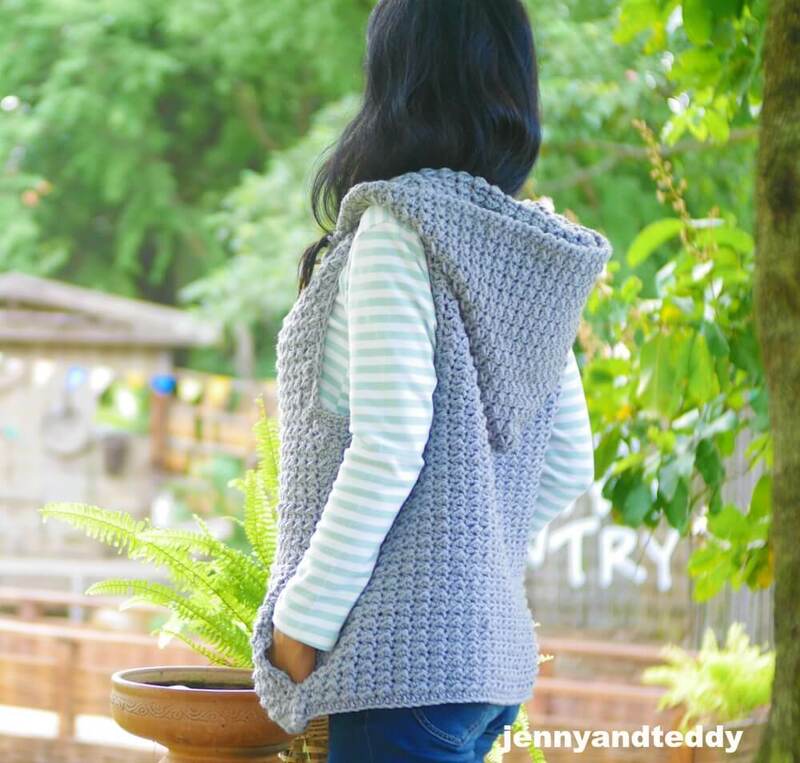 Even go for luxury and toasty warm 100% wool with Cloudborn Superwash Merino Bulky Yarn. I am using about 1400 yard all together. 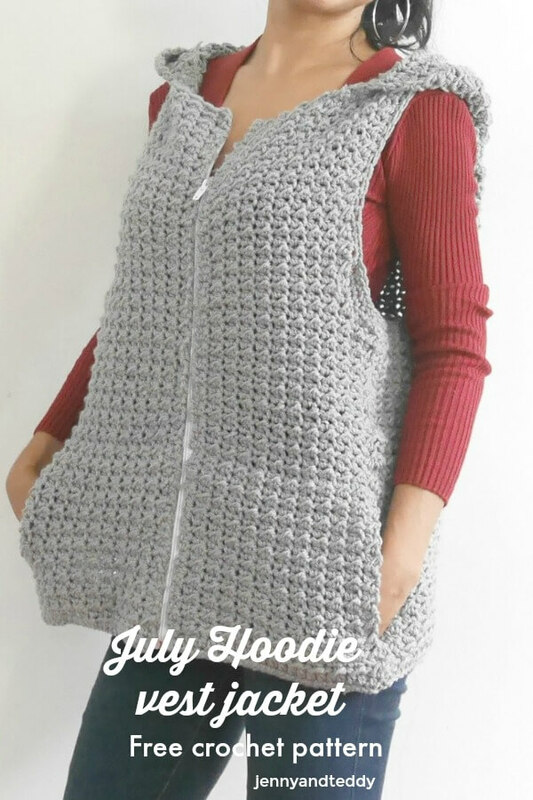 Finished Size Approximately: one size fit small and medium. 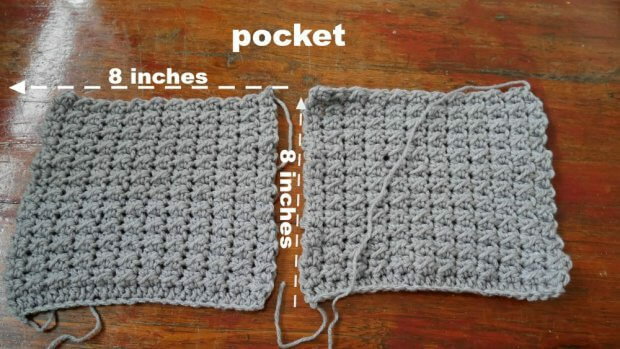 and size up to 2 xl see detail in the pattern instruction below. 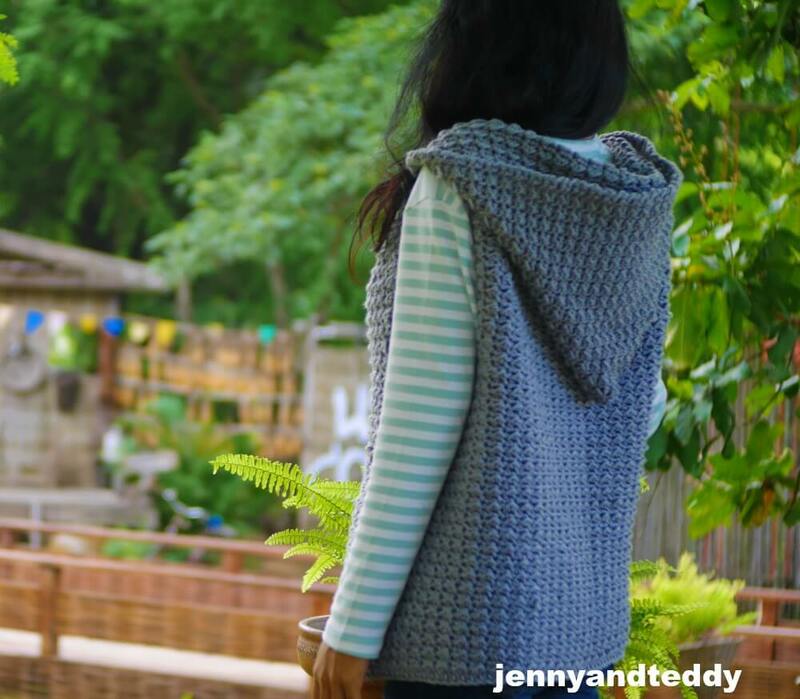 July hoodie vest jacket instruction. 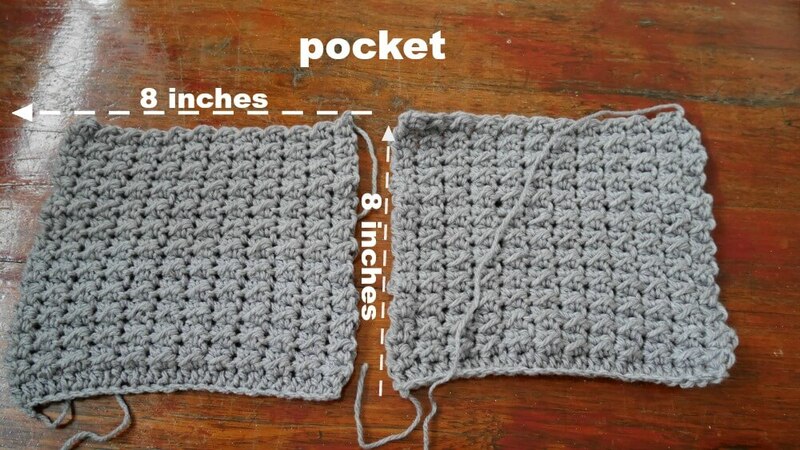 For the width: If you need to make it wider simply add more chain in even number to foundation chain..like 60, 70, 80 etc. 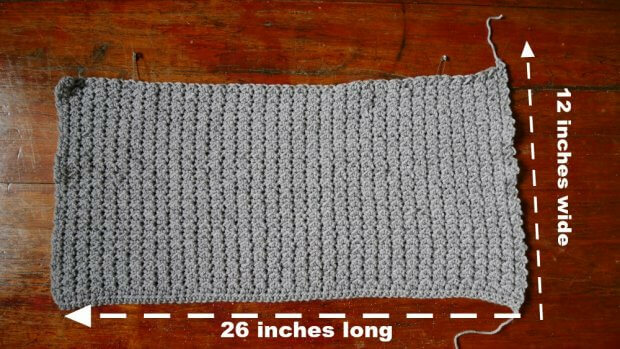 I start this poncho with foundation chains of 70. Row1. 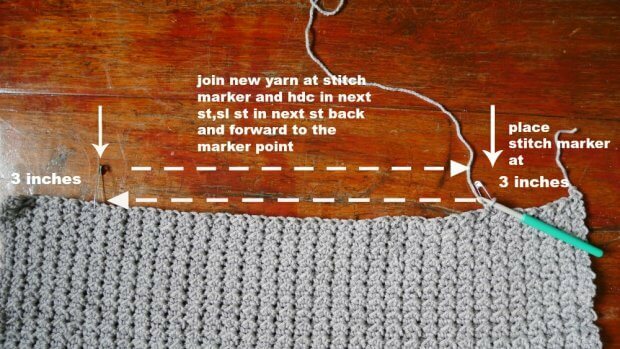 hdc in the next chain from hook, then hdc in each chain across until the end of the row, ch1 turn. Row3. 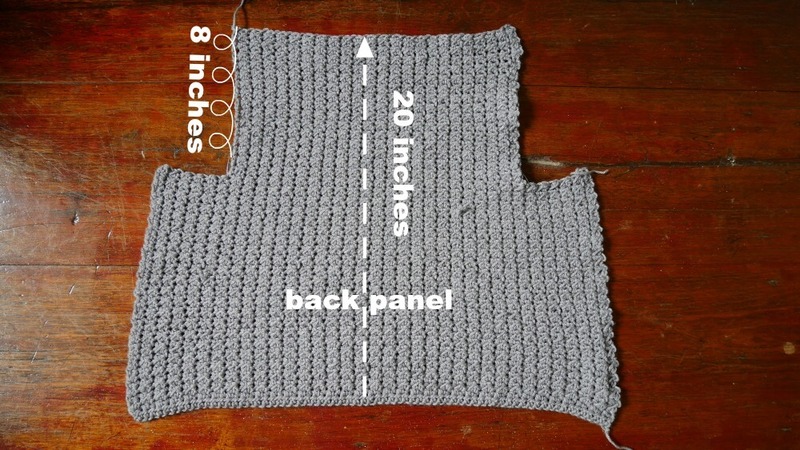 Repeat row 2 or until piece measures approximately 12 inch wide desired length. Fasten off. 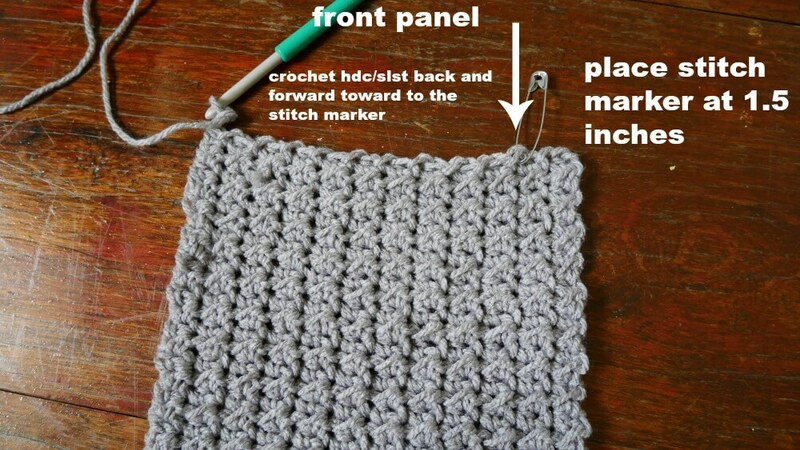 Then Place stitch marker at 3 inches each side of rectangle see pic below. 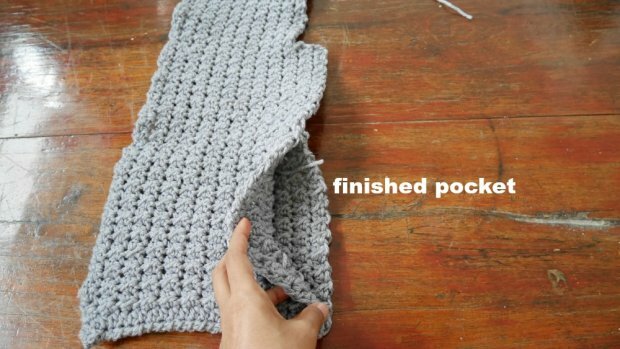 And join new yarn at one side of the stitch marker and begin to crochet hdc in next st, sl st in next st back and forward toward stitch marker and ch1 at the end of each row, until the piece measure approximately 8 inches long. Finished back panel then set aside waiting for assembly. Row3. 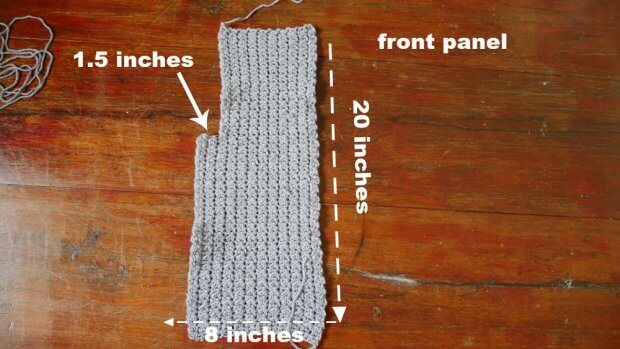 Repeat row 2 or until piece measures approximately 12 inch long or desired length. Fasten off. 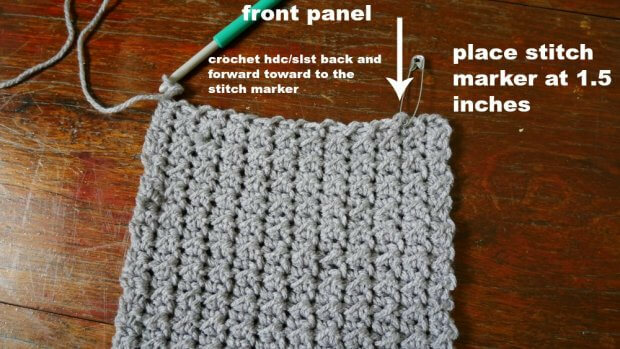 Then Place stitch marker at 1.5 inches at one side of rectangle see pic below. 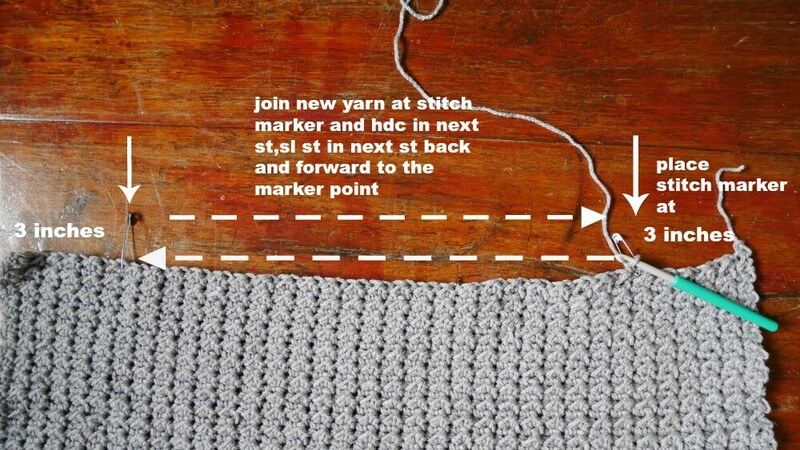 And join new yarn at one side of the stitch marker and begin to crochet hdc in next st, sl st in next st back and forward toward stitch marker and ch1 at the end of each row, until the piece measure approximately 20 inches long. 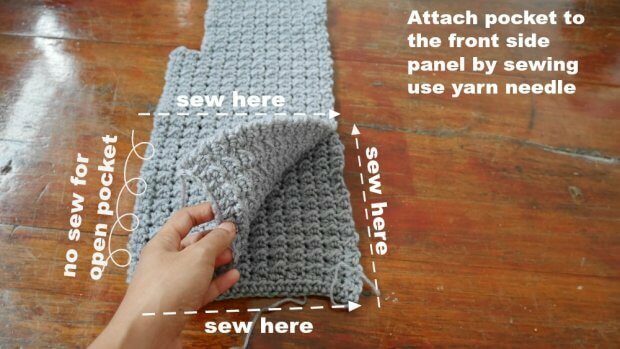 Repeat on the other side of front panel. Set aside waiting for assembly. Row3. 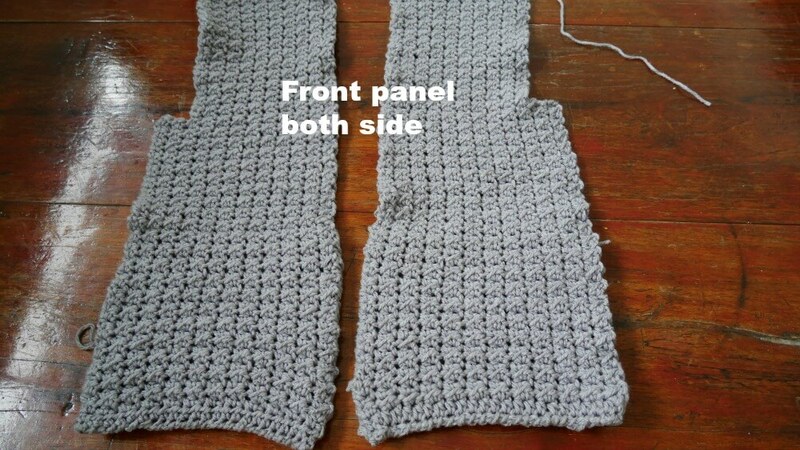 Repeat row 2 or until piece measures approximately 8 inch long or desired length. Fasten off. Set aside waiting for assembly. Row3. Repeat row 2 or until piece measures approximately 24 inch long or desired length. Fasten off. 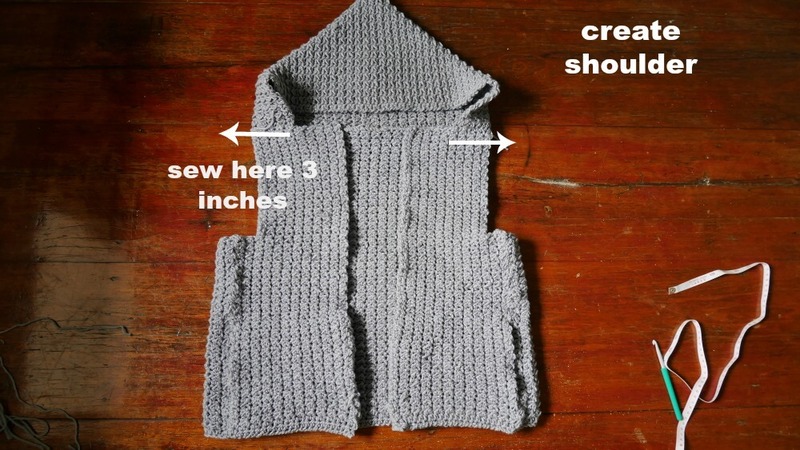 Then fold the rectangle in half and sew on one side to create the hooded. 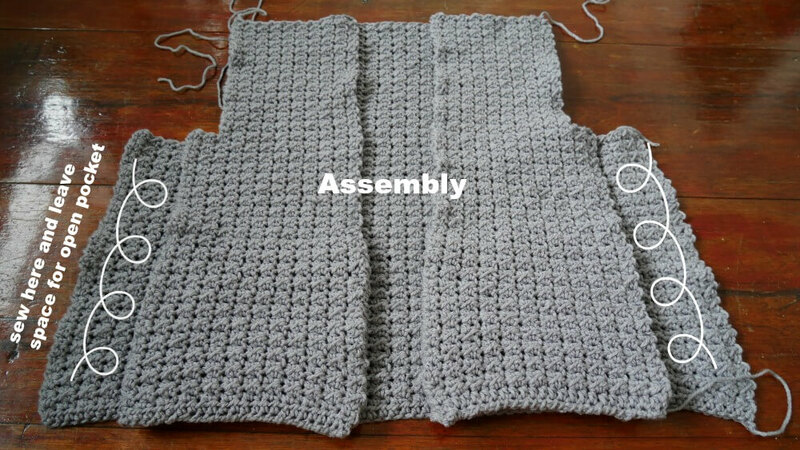 We will assembly the front panel first to create the pocket. Lay the pocket pieces under of the front panel so it not so confuse for right side or left side ( just my way ) but you guy can do it your way whatever is easy to for you. sewing them by use your yarn needle. Repeat on the other side. After finished will look like this. Time to assembly back panel to the front panel. 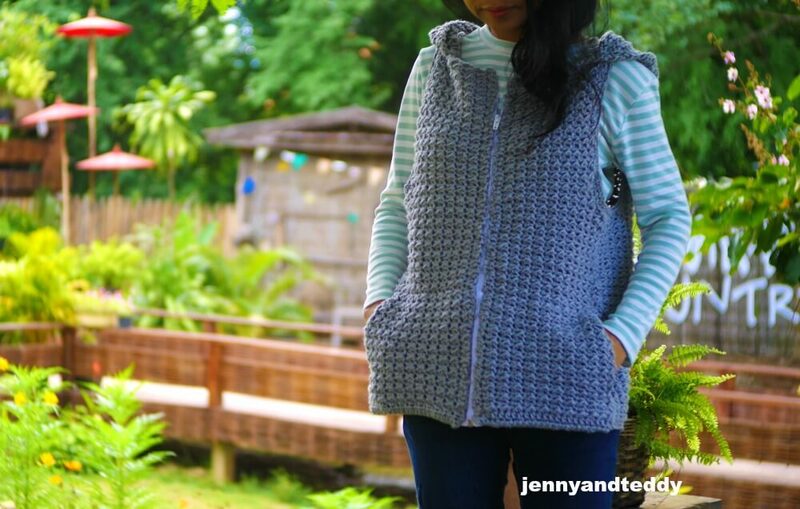 After finished sew of the back panel to the front panel now it time to attach hooded to the vest. Attach zipper to the jacket. Get the zipper at 20 inches length for small to medium size then unzip and line them up in flatted use clipper fixed the position when sewing. I am hand sewing. 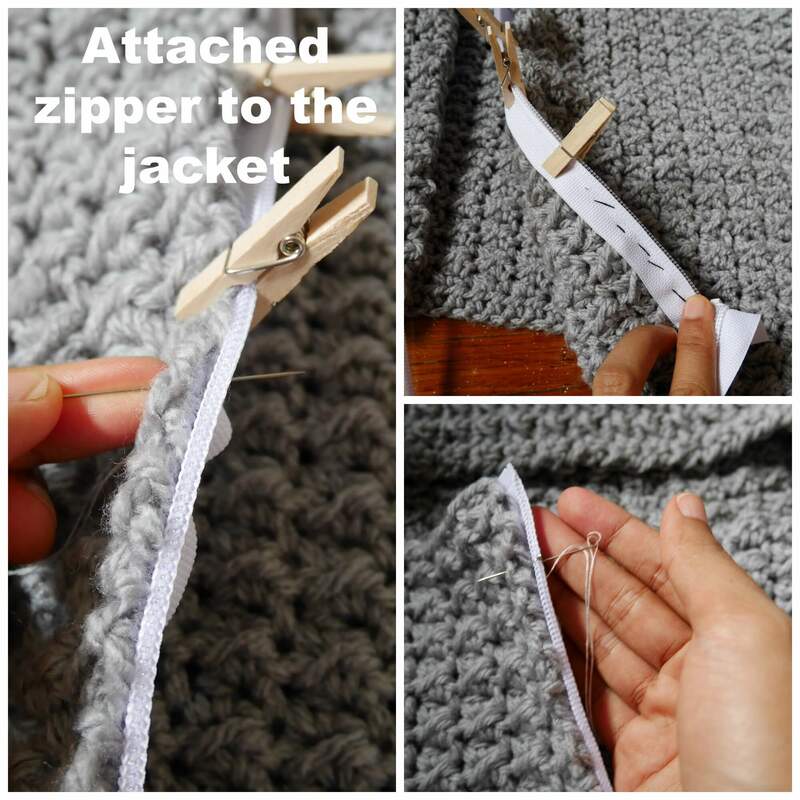 Bring thread needle and the thread color that match the color of the zipper and begin to sew. See pic below. 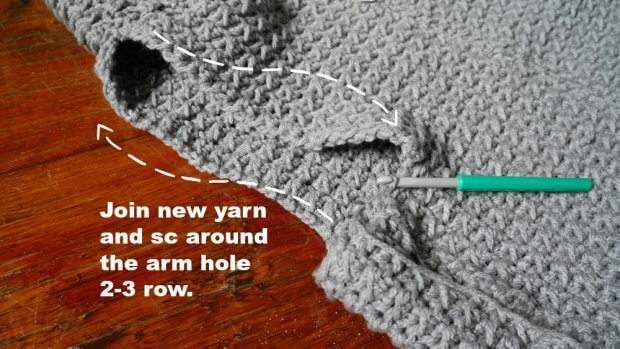 Finally, at the arm hole you will join yarn at the arm hole and sc around the arm hole for 2 or 3 row, All done! Hope you guy enjoy to make this Hooded vest jacket. 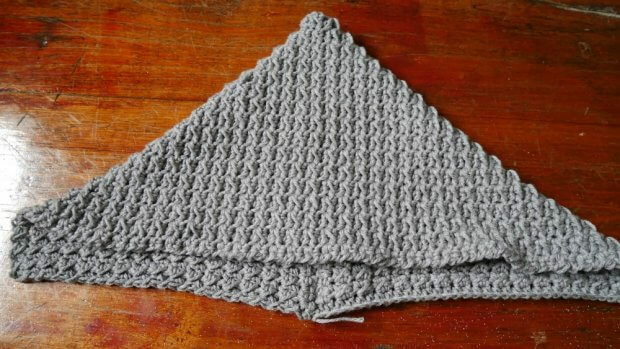 Wonderful pattern, I can’t wait to make this! Thank you so much for sharing it!!!! Thanks you Martha, hope you enjoy it.